Little Buddy is just beside himself excited about tomorrow. The wonder and magic of children should be spread around the Earth, maybe that is what we all need at Christmas and all year long. It makes you shop and wrap presents when you are coughing so hard you feel like you are losing a lung. It makes you take time to read Christmas books, so full of sweetness and innocence, with a warm little body on your lap. It makes you gather a little one into your arms and hope, just hope, that you are going to make their day special just like he makes every single one of your days. It makes you go outside and make reindeer food even if you are not feeling well, mixing oats and glitter so those reindeer can find your house no matter the weather. And to make even more for the little girls across the street because Santa has to see their house, too. It makes you appreciate the family you have with you and the family you are desperately missing this year. It seems to me that with each passing year I miss my parents more and more, is that possible? It makes you thankful for the friends that add so much to your life. I am talking about all of you in addition to the friends I see and talk to all the time. Friendship takes a lot of time, something we are all short of, it is a gift given all year round. Christmas is a time to sit back and enjoy those around you or simply the solitude of the day, and appreciate the love you have and give everyday. If you are missing loved ones I send you love. If you are overwhelmed by family, cooking and chaos I send you patience. If you are alone don't worry, I am sending you a hug and friendship. If you feel like you have lost your way, I am sending you hope for a new direction. If you have lost your home due to some horrific disaster, I pray that all becomes right again. I pray that our lives, in this country and all around the world feel less stressful in the coming year. We all deserve a break from the chaos and stress that greet us daily. I wish you all peace and love. Thank you for being here in this space of mine. Have a lovely holiday. Sending you love with lots of hugs from your family tomorrow Meridith - I suspect the two dogs are going to have the best time ever. Little Buddy is a delight and a charming young fellow. The ability to wonder and believe is precious. Hope you are feeling better each day. I'm sorry that you're missing your parents, it's such a hard time of year to be without loved ones. I know that little boy of yours will get you through though, such lovely photos in your post. Wishing you and your family a very merry Christmas. I hope that your Christmas would be enjoyable and may the essence of Christmas remain always with you. Merry Christmas . Merry Christmas . If we have our health ,family to love & our faith we have everything . Merry Christmas! Have a wonderful time with all of your guys! You wrote so beautifully, I am speechless. Merry Christmas Meredith! Thank you for this wonderful post. It contains so much truth. Enjoy your day with your family! Merry Christmas! 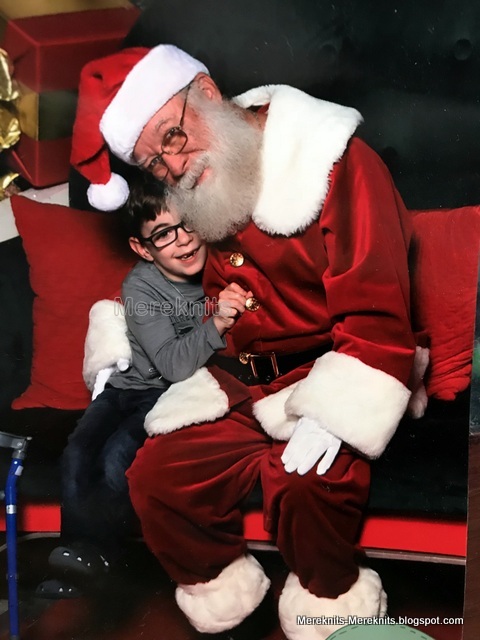 That is a fantastic picture of Little Buddy and Santa! Merry Christmas Meredith. It is so good to be with my kids. Lil buddy on Santas lap is so sweet. Sending you warmth and hugs! Lovely post. I didn't know about Reindeer food. What a wonderful idea. Hope you are having the best Christmas ever! Little Man looks like he's loving being with Santa!! Cute photo!! And those two boys, how did you ever get them to pose for that.. so funny and wonderful they are! I hope your little guy gets all of his dreams answered this morning.. lol!! We had our big celebration last night with roast beef, potatoes and carrots.. then the gift free-for-all.. today it will be quiet. We had lots of excitement this year also. 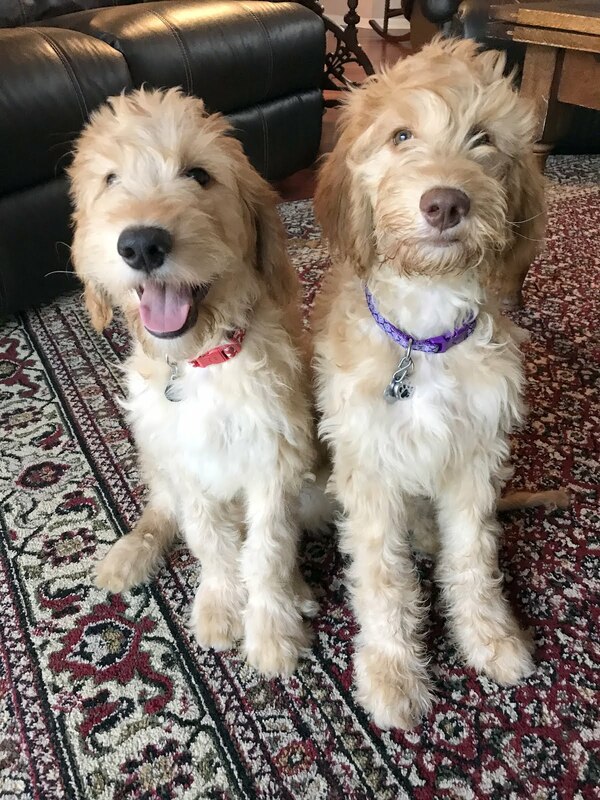 Tiger and Scout just loved everything and everyone! I am so blessed. Merry Christmas! I think this space of yours is most special! I have been gone most of this day. and so as usual... late to come here. but always so happy that I did. I had what you have the entire month of November and most of December. coughing like an old Wino on Reno Street. you almost seem to get used to it after a while. but then I never had to WORK with it like you do and will. and also while being the wonderful Mother that you are to beautiful little boys both human and puppy when you finally get to come home and rest! we must ever keep the innocence and love we see in their faces right here in OUR hearts. it will save us. Meredith, please take care of yourself; don't delay seeking medical care. My husband had that horrible cough, bad cold... felt like 'the flu', for several days. when the breathing got labored, off we went to urgent care. after chest xray, breathing treatment, antibiotics and cortisone he's feeling better. Had pneumonia. Oddly, his brother was having similar symptoms & ended up in the ER. Similar treatment, also now feeling better. love those pictures. You are so correct about these little children's excitement spilling over into our lives and all those around them. I rarely comment on your blog, but truly enjoy reading and viewing your pictures. Our 10-year-old grandson (who lives with us) loves seeing pictures of Little Buddy & your dogs. 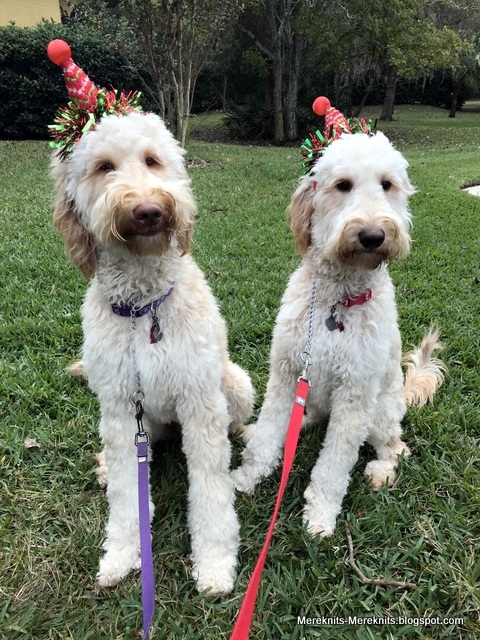 The boys look adorable in their little Christmas hats. I hope LB enjoyed his Christmas, and hope you got to put up your feet and relax for a bit. Here's to a peaceful, healthy, and happily productive 2019 for all of us. Bless you! I was very moved by your blog. I miss my parents and often wish I could have a window of time with them again. I'm sorry you are not well. I always enjoy reading your blog but have not commented before. I do enjoy hering about Little Buddy's life. I was struck too by the omission of information to prepare for his procedure -- I always feel lack of communiction is one of the biggest problems in the world today. I hope you are feeling better. All good wishes. Thank you for all of those gifts. And the chuckles provided by the picture of the boys at the end! Thank you for your beautiful thoughts and words, Meredith. Your online friendship is treasured. I'm sorry that you have felt less than 100% physically this Christmas and I hope you are properly well in time for New Year's Eve.